View More In Cereal Bowls. Start your morning off on the right foot when you eat your favorite breakfast from your very own Personalized Ceramic Breakfast Bowl. Add a funny, sweet or sentimental message to this Personalized Cereal Bowl to create a fun way to start off your day. 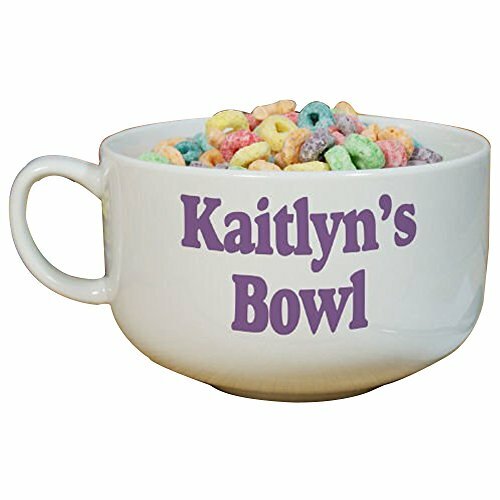 Your Personalized Cereal Bowl is a ceramic bowl that features a convenient handle and holds a generous 32 oz. of your morning cereal, oatmeal or morning treats. Each bowl measures 5 1/2" in diameter & 3 1/2" high. Hand wash only. We will personalize any bowl at no additional cost!